For the Meyer family, Wigle Whiskey isn’t just a business. It’s a commitment to the community to bring back a historic craft lost in this area decades before. The operation they’ve built from a small space in the Strip District has grown over the years from the grains of an idea into a multifaceted enterprise. For those that work behind the scenes, Wigle has given them an opportunity to build a narrative for the brand and connect people with their neighbors and their city’s history. Mary Ellen Meyer, co-owner, who is affectionate on the Lake. In the heart of wine country and inspired by the viniculture, the Meyers decided to put their own spin on another spirit they loved – whiskey. When early German settlers discovered barley didn’t grow well in Pennsylvania’s rocky, clay-based soil, Monongahela Rye was cultivated as an alternative. With excess grain and Scottish stills, the whiskey culture began to flourish in the heart of Pittsburgh throughout the 1700s. 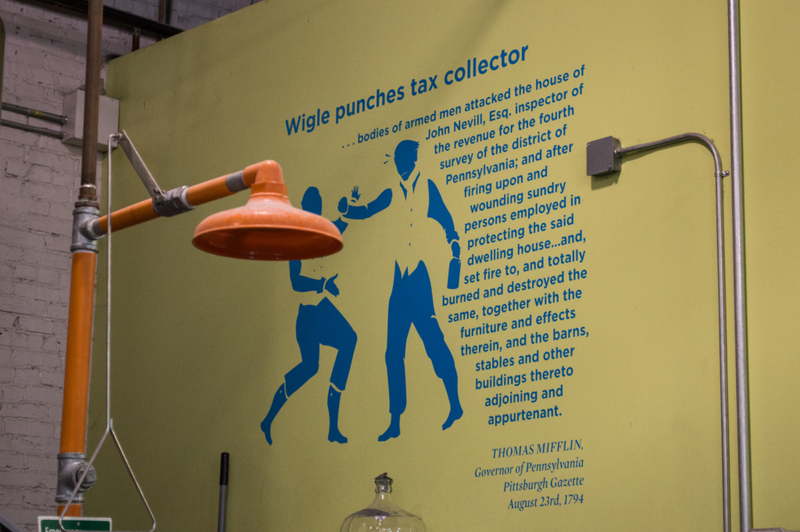 PHILIP WIGLE IS THE INSPIRATION FOR WIGLE WHISKEY’S BRAND – ONE OF THE FIRST DISTILLERS TO PUNCH A TAX COLLECTOR, SETTING IN MOTION THE WHISKEY REBELLION. According to Anthony Levenson, the front of house manager at the distillery, Monongahela Rye created a unique flavor profile when produced into whiskey. Following the Revolutionary War, whiskey became a form of currency for farmers tilling the tough land of Pennsylvania. As the newly formed government became more aware of the scale of production of this spirit, they induced a liquor tax to help alleviate debt from the war. Distillers, angry that their newly formed government was taxing them like their rulers before independence, refused to pay. Many didn’t have the means to do so because they bartered with their spirits for necessities instead of exchanging currency. For those that began to be summoned to court, this meant a long, potentially dangerous journey from the Monongahela Valley to Philadelphia. Distillers began to organize – among them was Philip Wigle. As the mob burned down a tax collector’s house and threatened more violence, President George Washington marched 13,000 men to enforce the new nation’s laws. Wigle was one of the arrested, taken to Philadelphia and sentenced to hang for treason before he was pardoned by Washington. According to the Wigle Website, Allegheny County produced half a barrel of whiskey for every man, woman and child living in America by 1808. Prohibition dealt a devastating blow to the industry though and distillers haven’t processed rye in the city of Pittsburgh since then, until Wigle opened its doors in December 2011. Before opening doors to the public, the Meyers discovered they’d have their own issues in government regulation. Mark Meyer, identified as co-owner; distiller, and roof leak fixer, used his previous experience as an attorney to lobby for a key law change that could make or break their business. After two years of dedication, Wigle Whiskey was finally able to legally distill and sell their craft liquor on-premise – directly to their tasters. Another key point Wigle has included in its business model is using local and organic ingredients in its liquors. The grains used are from farms within 300 miles of the distillery, most coming from Washington County with its deep soil and prime growing conditions. WIGLE DISTILLS THEIR LIBATIONS IN LARGE COPPER STILLS THAT CREATE A UNIQUE, STRONG FLAVOR THROUGHOUT THEIR LINE OF PRODUCTS. As Wigle began to grow, they branched out into other libations – gin, absinthe and flavored liqueurs. Just this year, Wigle released a honey spirit, coffee liqueur, rhubarb liqueur and more – ranging from $40-45 for a 750-milliliter bottle. Along with product releases, Wigle made the decision to branch into local history and agriculture a little further with the October opening of Threadbare Cider House. Threadbare covers another part of Pittsburgh’s history – Johnny “Appleseed” Chapman. Chapman is remembered as a pioneer who introduced apple trees to the Pennsylvanian landscapes in the late 1700s through early 1800s. The new location, found on Spring Garden Avenue in the Northside, is right down the street from Wigle’s storage space and summer event venue, the Barrelhouse. WIGLE WHISKEY STORES MUCH OF THEIR PRODUCT IN THEIR BARRELHOUSE, A VENUE THAT IS ALSO OPEN TO THE PUBLIC THROUGHOUT THE SUMMER FOR OUTDOOR CONCERTS AND EVENTS IN THEIR WHISKEY GARDEN. Andrea Mignanelli, who interned and performed at the Barrelhouse over the summer, said that not-unlike other Wigle branches, it was a hub for activity. According to Meagan Gemperlein, director of distillery programs, operations and offsite events, Threadbare is also an all-encompassing location. The transition has its roots in Wigle’s production of their Walkabout Apple Whiskey, $58 for a 750-milliliter bottle. According to one of Wigle’s newest staff members and private events manager, Taylor-Mary Smith, opening the 10,000 square foot historic tannery into a cider house was challenging but attainable due to a devoted staff. That goal – making Pennsylvania whiskey and cider known to everyone – is being achieved on a national level through the Omni Tasting Room at the Omni William Penn Hotel in downtown Pittsburgh, according to Sarah Pasewicz who works at the location. Customers can choose every part of their drink – spirit, syrup, bitter and garnish – for $12 a glass. They even offer absinthe for those who like their sazeracs. Wigle offers tours and tastings regularly for $20-25 per person depending on the time. For a lot of their staff and customers, however, special events at the locations hold their favorite memories related to the brand. According to Levenson, Wigle has been able to stretch their creative muscles by collaborating with local brewers. “We’ll actually bring [local brewers] in and make a whiskey that is a distilled version of a beer that they’re already producing,” Levenson said. Probably the most community-centered event all Wigle locations participate in are their Bantam nights. Allowing nonprofits to use their locations as a meeting place, Wigle also gives those non-profits a percentage of bottle sales that evening. “If you are doing good in Pittsburgh, you can use our space to continue that mission,” Meyer said. Organizations like Doctors Without Borders, Young Preservationists and the Women and Girls Foundation are among the many that have used Wigle’s space. “It’s great for us because we get to give back and we get to show off our stuff too,” Levenson added. Wigle Whiskey is a small business with a lot they are looking to offer to the community – education, libations and a look into the process of distilling and brewing, but perhaps their greatest contribution isn’t their locally-sourced alcohol – but their deep-rooted appreciation for their staff and neighbors.